The rules for Roller Derby are quite simple. The Jammers try to get through the pack. 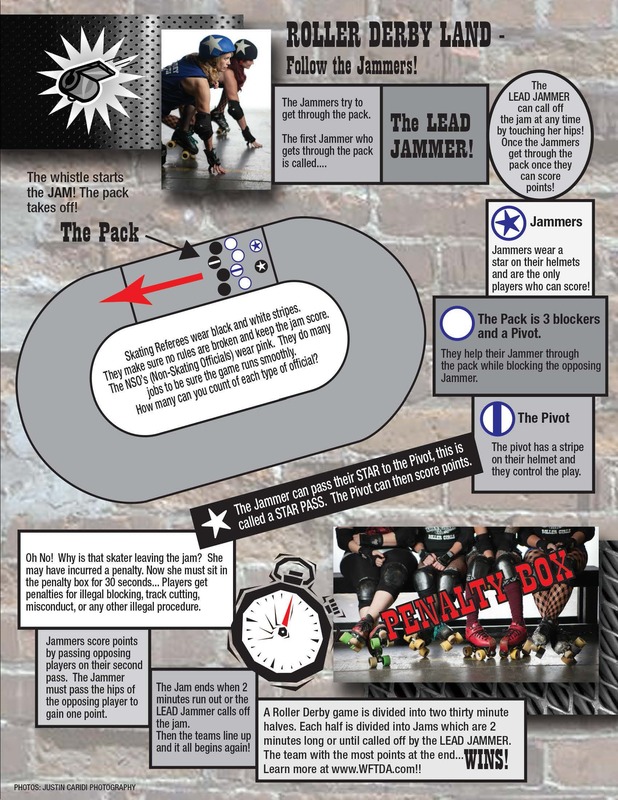 The first Jammer who gets through the pack is called The Lead Jammer. The Lead Jammer can call off the jam at any time by touching her hips! Once the Jammers get through the pack once they can score points! Jammers wear a star on their helmets and they are the only players who can score! The Pack is 3 blockers and a Pivot. They help their Jammer through the pack while blocking the opposing Jammer. The pivot has a stripe on their helmet and they control the play. The Jammer can pass their STAR to the Pivot, this is called a STAR PASS. The Pivot can then score points. Skating Referees wear black and white stripes. They make sure no rules are broken and keep the jam score. The NSO’s (Non-Skating Officials) were pink. They do many jobs to be sure the game run smoothly. How many can you count of each type of official? Oh No! Why is that skater leaving the jam? She may have incurred a penalty. Now she must sit in the penalty box for 30 seconds… Players get penalties for illegal blocking, track cutting, misconduct, or any other illegal procedure. Jammers score points by passing opposing players on their second pass. The Jammer must pass the hips of the opposing player to gain one point. The jam ends when 2 minutes run out or the LEAD Jammer calls off the jam. Then the team lines up and it all begins again! A roller derby game is divided into two thirty minute halves. Each half was divided into Jams which are two minutes long or until called off by the LEAD JAMMER. The team with the most points at the end WINS!